Effectively eliminates soil compaction up to 20 cm depth. Can be equipped with slitting knives or heave knives as well as coring tines. A wide range of options allows user to select best set up to suit every situation. For example on golf greens fine knives will allow a working depth of 15 mm. 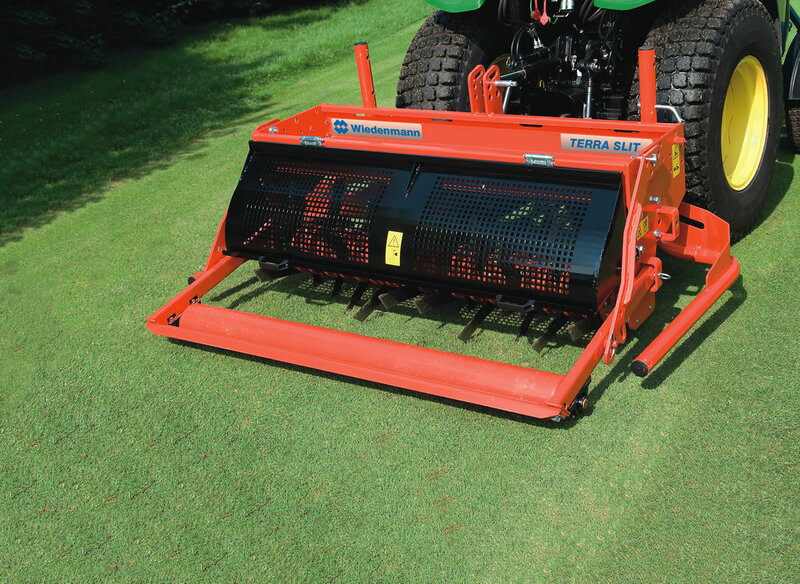 Or equipped with hollow tines (2.5 cm diameter) it can make 80 holes per m² in one run with 15 cm spacing. Ideal for cutting out thatch and for aeration of the upper soil layer to a depth of 8 cm. For heavily compacted soil the standard supplied ballast frame may be weighed down with additional weights. On request, a hydraulic weight transfer system (suitable for 3-point cat.I) is available. If you are interested in our TERRA SLIT use the quick enquiry form below.